When Bishop John Schol started a two month-long ministry of praying specifically for each district in GNJ, he had no idea of the impactful blessing and stories that would surface. For nine weeks starting on February 6, Bishop Schol prayed for the districts and heard the joys and concerns of laity and clergy, encouraging them to share their requests. “Some invited me into their deep hunger and pain in their life,” said Bishop Schol, who felt a “deep honor” to be entrusted with the prayers. Others shared their concern for the world and the people they knew. Bishop Schol was asked to pray for people addicted to heroin, organ transplants, hunger, loved ones who were dying or had died, immigrants and various other concerns. The prayer time became part of his daily devotion as many throughout GNJ shared stories of how God was making a difference in their congregations. Rev. Laura Steele, who is part of Mosaic Ministries, pastors at East Millstone UMC and Mt. Zion, Hillsborough. She came from a background of working in medium-to-large size churches in both New Jersey and Virginia to Mt. Zion; a one room sanctuary church on the side of a mountain. “You actually have to take a dirt road to get to it!” Steele exclaimed. “What a shock for me having lived in New York City and the D.C. metro area to be serving such a small, rural church.” Steele shared with Bishop Schol that at first she was scared and confused and wondered how the church could be thriving with no programming and about 25 worshippers. Steele described Sunday morning’s with congregants moved to tears of joy and voices raised high among the mountain trees. Steele’s testimony spoke to the power that lies in small churches; giving voice to what the Holy Spirit does in those spaces. Rev. Peter Mantell, pastor of Kingwood UMC in Stockton shared with Bishop Schol a story of how one small act of kindness led to a bequest that included approximately $750,000 and two parcels of land totaling 86 combined acres. “To think it happened because we simply delivered a Shepherd’s Pie to a homebound woman in Kingwood,” said Mantell, who upon learning of his appointment to the church three years ago, heard that it was known far and wide for its roast beef dinners. “This tiny little church pulls together and serves 300-400 meals in a single night,” he said. “It’s truly amazing how well this operation works, and they’ve been doing it for about 40-50 years!” In the last 18 months, the church started their Shepherd’s Pie ministry. 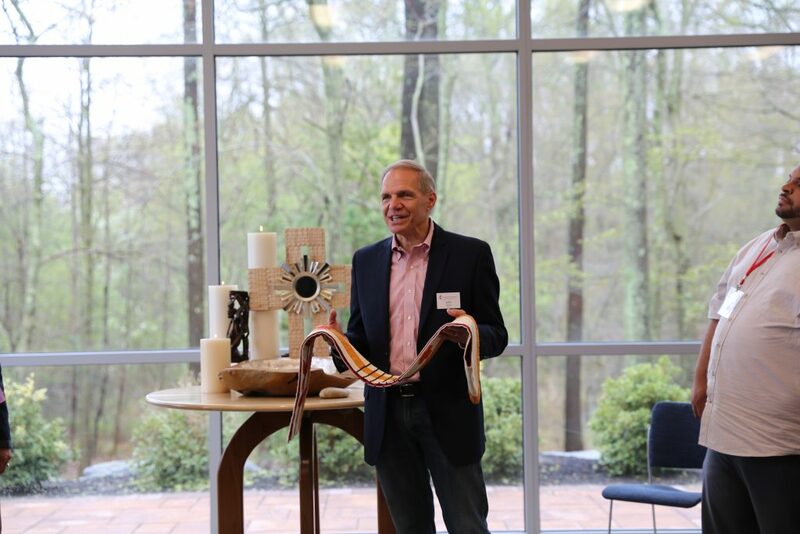 The church has focused on visioning before spending, and has since worked with the United Methodist Stewardship Foundation of Greater New Jersey on how to be the best stewards of the newfound resources. Pastor Paul Jaw of Flemington UMC that his community is reinventing itself to attract young families, branding itself as a community of music and arts. The church decided it would reach this demographic through music; something Jaw considers “second nature” to his church. Through trial and error, Jaw learned from his experiences and invited several music groups to use the church for performance and practice, including The Hunterdon Harmonizers, The Denzer Piano Studio, and the NJ Women Song. There has been interest in using the building to generate income for the church. “The trustees agree that we should give special consideration to any organization or entity who will contribute to branding our church as the leader of music and children’s ministries,” said Jaw. The success of the church’s Youth Music Showcase, a program that offers scholarships for young people to compete and earn, has been wide-reaching. Two years ago the church received a $170,000 bequest from a graduate of the Flemington Choir School, which was the first in the country. The second Youth Music Showcase was held in February and the response was overwhelming. Almost 40 young people competed for $2,700 of prizes. The showcase provides incentive and recognition to talented, motivated students who perform their pieces of music in a public formal setting. County residents have called to thank Jaw for the event, and regional music teachers have registered their students in participation. The Hunterdon County Council for Young Children began holding their meetings at the church with Jaw joining the council. At the meeting, mothers discussed needing a place for their children to play in the winter. “So we decided to turn our Fellowship Hall into a children’s winter playground,” said Jaw. “We named it ‘The Fun Zone’ which runs from January through March.” The response was so overwhelming the church decided to hold a Fun Zone program for the summer months as well with now more than 70 new families participating. “Now that we’ve got these children and families to swim our water, it’s time to put in some hooks to keep them here,” said Jaw, who plans on starting a drama program to teach children important skills, grow imagination, and develop friendships. As an answer to prayer, a congregant stepped up to lead the drama program with a goal to open it to the community this fall. The church is also exploring win-win partnership options. Jaw hopes the programs will succeed in branding the church as musical and youth friendly.